I was traveling from Point A to Point B. Well Point A was dropping of a borrowed car and Point B was the bus station. 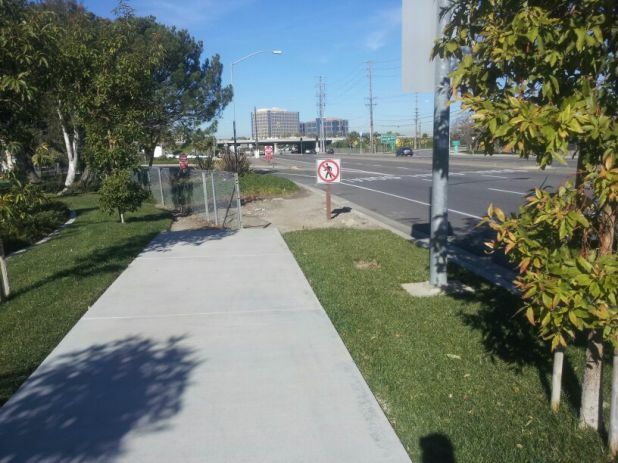 On the way to the bus stop there was a no pedestrian sign. Now it would have been nice for it to a corresponding sign at the other end warning of the upcoming sign. Unfortunately there wasn’t and of course I ignored it and walked right past it. Well it does bring up a worthwhile topic of taxes. I think it’s time to institute a Sneaker Tax for the purpose of constructing and maintaining sidewalks. Cars are expected to pay for their roads and highways through gasoline taxes, so why isn’t walking expected to pay for it’s on way? Surprisingly there are 300 million to 2.4 billion pairs of shoes sold each year. This means the shoe tax could be fairly reasonable at $5-10 per pair of shoes which would raise billions of dollars for sidewalk construction. We could spend this money to improve sidewalk travel throughout the country. Making safe routes for kids to make it to school and for pedestrians to safely make it to the bus stops. Many lives could be saved and injuries avoided if we improve pedestrian travel. Around 4,000 pedestrians are killed each year and 59,000 injured. Wouldn’t it be worth it if we taxed shoes from 1% to 200% of the cost of shoes?